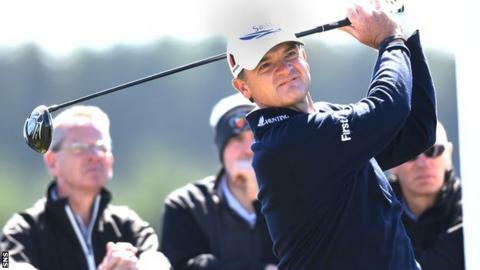 Former Open champion Paul Lawrie believes he still has what it takes to get back to the top in golf. The Aberdonian, 46, has struggled with injury in the past two years and has now dropped to 334 in the latest rankings. Lawrie was speaking at the launch of the European Tour match-play tournament that will carry his name at Murcar Links, near Aberdeen, this summer. "I've still got the desire, I still want to win," he told BBC Scotland. "I was properly disappointed at my back nine last week in China [missed cut after hitting seven over par in the first two rounds], I didn't see that coming, so if you're still getting disappointed and feeling bad about things like that then you've still got a little bit in you to kick on. "I feel I can get back in the top 50, I don't see why not. "I've had quite a few injuries in the last 18 months to two years which have been niggling little things. "You can still play but you're not 100%. So that's been quite difficult. "I still feel I can get back up there. Time will tell." Lawrie may need one of the two invitations to play in his own event, the Saltire Energy Paul Lawrie Match Play from 30 July to 2 August, but is delighted to be bringing a major event back to his city after Royal Aberdeen hosted last year's Scottish Open. "Another event on the schedule for Scotland is exciting," he said. "To bring people back to Aberdeen specifically was the main idea on the back of the Scottish Open success." This weekend sees Scots Stephen Gallagher and Marc Warren take part in the World Matchplay in San Francisco, and Lawrie has high hopes for them both. He said: "They've both been playing really nicely. Stevie obviously last year had a fantastic year and it was important for him to get in the Ryder Cup. "He set his stall out early like I did in Medinah, he made no secret of the fact he wanted to play and for him to get in that team was a massive achievement. "Mark's been playing some wonderful golf. I played a practice round with him in one of the Middle East events and he just blew me away. He's just gone up two or three notches as a golfer. "So we're hoping they both have a great week and take a few people down."